My first time up to N Seoul (Namsan) Tower was by cable car. There was a wide variety of information on how to get to the top of the tower but my friend and I got lost trying to find the cable car station with the instructions that we had online. So we ended up taking a taxi to the station after climbing hill after hill with no end in sight. I thought that the elevator to get to the station was pretty cool as instead of moving up and down, it moves sideways to get to the top. 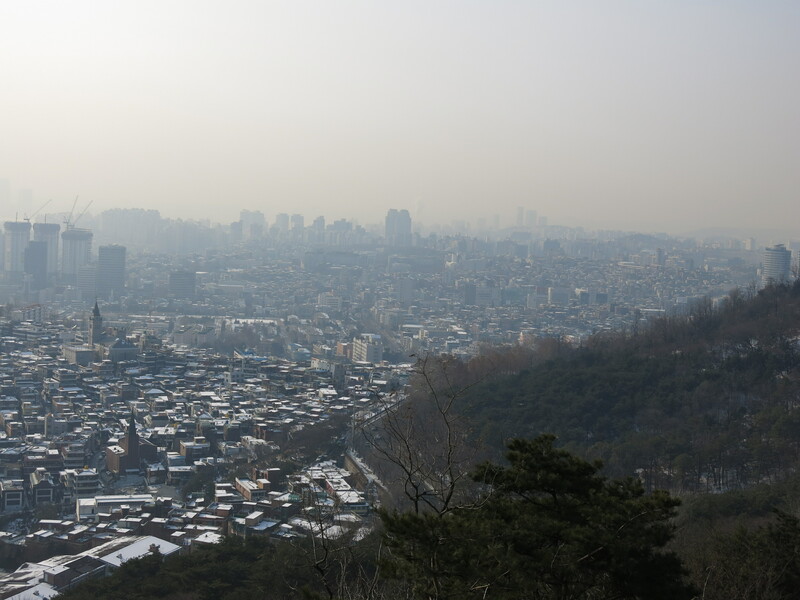 The ride up Mt Namsan was pretty smooth, and the views are quite pretty too if you managed to get a spot by the window. For those who are acrophobic, I can suggest that you move to the middle of the car so that you do not see out of the windows. It also helps if you are short of stature (like me), which will mean that you will absolutely get to see nothing but other peoples’ underarms when standing in the car full of people. If you like to travel in comfort, you can hop on one of the buses that are available from Myeongdong station. The bus will bring you to the top of the mountain but will stop some distance away from the tower, giving you the opportunity to stretch out your muscles (or strain) before getting there. On another occasion, I was feeling adventurous since I have been up there a couple of times. So I decided to hike my way up. On my own, on a cold and wintry day, I prepped myself up for a very hard hike. Or so I thought. 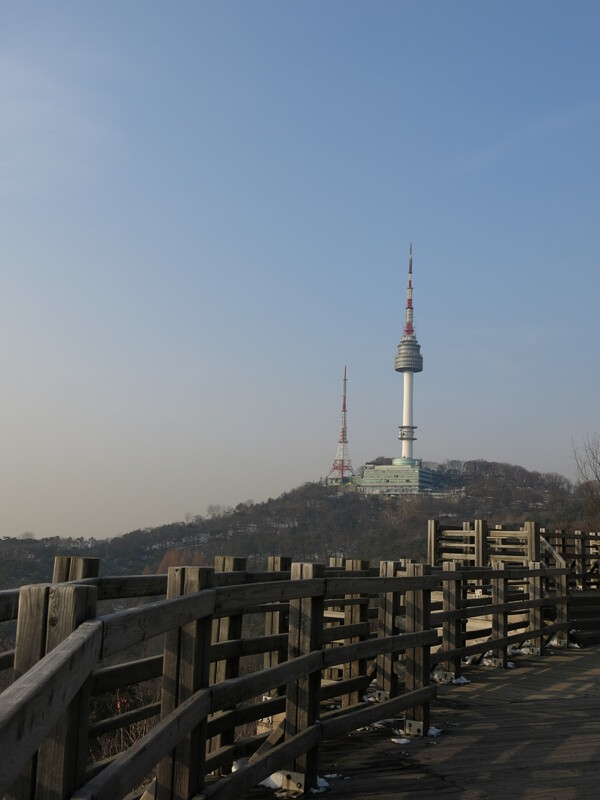 It turned out that I had managed to get onto another trail, the pretty one with the view that overlooks Seoul so I took time to meander my way up. So the hike to me wasn’t really that bad. It took a few hours but it was slow and the slope up was gradual. So which would I choose to go up? For a first time visitor, it’s fun to take the cable car up. You also get to catch some of the views if you manage to grab some space by the window. If you are looking to save some money, hiking up is a great way to get there, especially as you will get the same view as from the top of the tower. You don’t really need to be super fit to do it, I’m not. You can instead take your time to enjoy the view, the mountain air and the passers-by. Of course, I did this in winter, so it was a refreshing walk for me. For those with weak legs, I suggest taking the bus directly up. There may be a slope towards the end to climb after the bus drops you off but getting to the cable car and down requires you to take stairs. I’m not too sure whether they have any lifts available though. Myeongdong station, exit 4. Walk in the direction of traffic along the main road, towards Shinsegae department store and Hoehyeon station direction. You will come to a big junction at the end of the road, turn left and continue walking. So you are literally walking in an L shaped path from the subway exit for about 20mins. 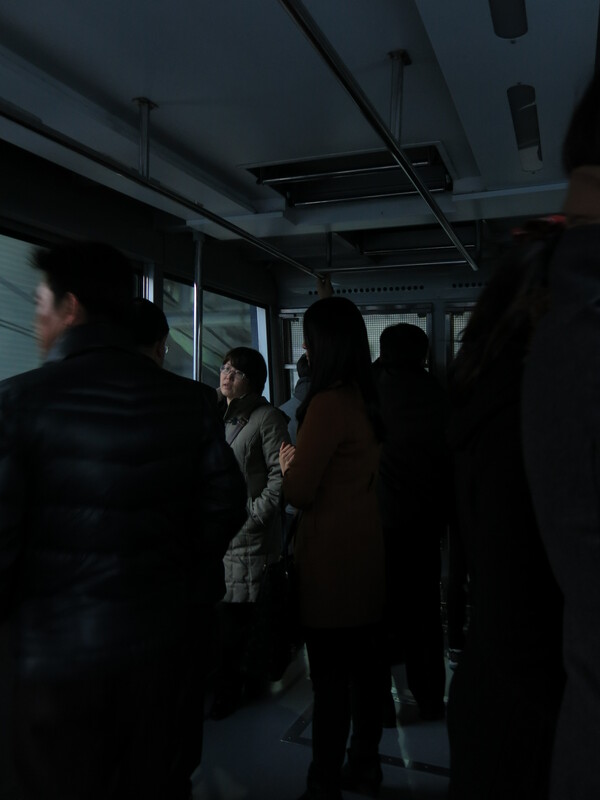 You will reach a slanted elevator which is known as the Namsan Oreumi. Take it to the top and walk a few minutes to the station. By bus, you can take bus no. 5 from the bus stop near Myeongdong station, exit 2 (close to Prince Hotel) all the way to the top. For the adventurous one, there are many nature trails up with different levels of difficulties. Their official website lists down the routes available for all to try here. If you wish to explore it the way that I did, follow me! Dongguk University Station, Exit 6. Once you exit, turn around, walk straight and turn right at the big intersection. This is also walking around Dongguk University, just make sure the building is always on your right as you walk towards the intersection. After turning right, do enjoy the beautiful scenery of their beautiful ponds on your right as you continue up the pathway. When the road split into 2, take the left one and head in the direction of National Theatre (Point A in the map below). 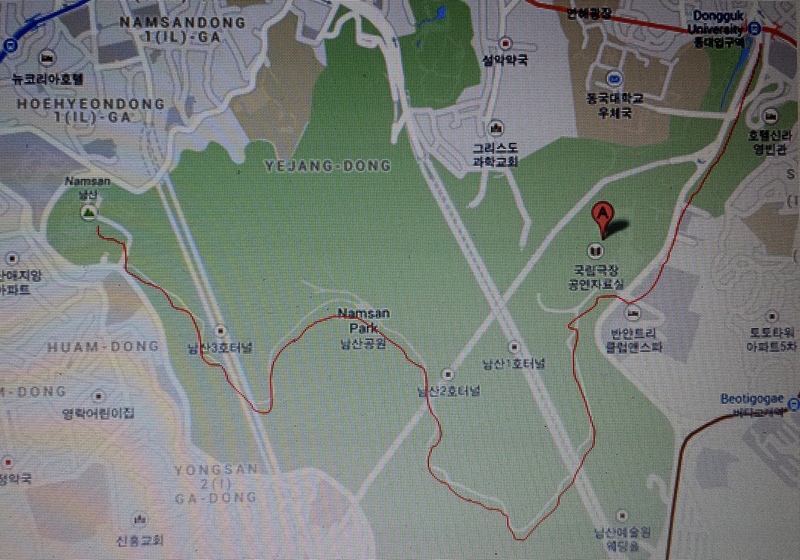 From there, it’s the start of the nature trail up towards N Seoul Tower. You will also come to a rest point where you can choose to continue to trail A or B. Here, I took the left trail as there were not much directions and I ended up walking up a slope all the way to the top. Along the way are photo points where you have a good view of the city below as well as a place to rest if you are tired.